To sell something online, you have to persuade the customer they can trust you. Think about how you make buying decisions: would you order something from a company that doesn’t seem credible? Exactly. But building that trust is more difficult in the impersonal Internet world: you can’t personally welcome your website visitor and have a friendly chat with them. Making customers trust your business becomes the job of your web content, and here’s how you create content that does the job right. Some businesses think the more intelligent their content sounds, the more professional they look to their readers. But using fancy corporate words will not help you win the customer’s trust, because people trust someone they can relate to. So instead, try writing content that sounds like a regular conversation, and the readers will feel like you are talking to them. Your post can be valuable, informative, and based on facts, but if it doesn’t have an emotional component, you will not get a connection with your reader. Whatever you are writing about, people are reading it because they have some sort of problem or need. Show that you understand that need, know how they feel – and the reader will trust you more easily. Sales pitches belong on the sales pages of your website, but when you produce a blog post, a video, or an infographics, put your sales language aside. Pushing your product in every content piece you create doesn’t help you build a positive image of yourself as a knowledgeable and trustworthy resource. Instead, produce content that answers possible questions and addresses problems of your potential customers, and they will start viewing you as an expert on the issue, someone who can be trusted. Make sure the readers know who the author is. Authorship information is a powerful trust building tool. Firstly, when you put a name and a photo on your content, readers have a better, more personal connection with you as the author. Secondly, an authorship box is just the right place to mention why you are an expert in the field, so you score another credibility point. Getting customers trust your expertise is not only about the content, just like making people trust you in real life is not just about the way you talk. Still, when you are trying to attract customers on the web, content is your major weapon. 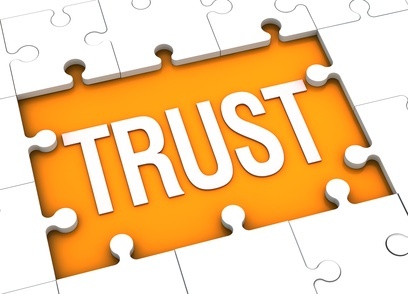 What do you do to build trust for your business online? How important do you think content is for that? Share your thoughts in the comments below.